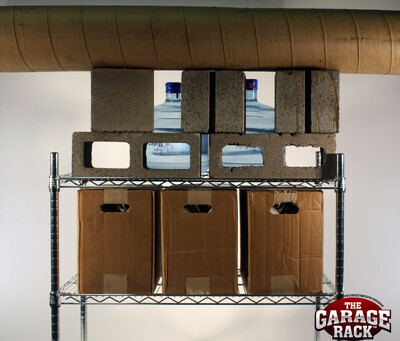 The Garage Rack™, originally designed for the firehouse and customized for your garage. The conversation started when a company based in Illinois that produces shelving for firehouses ordered a floor from us. They build shelving and storage units that are used by firehouses around the country. Minimum 800 pounds per shelf capacity, modular, customizable design, its a garage storage shelf built for your garage, not somebody else's! The Garage Rack™ is perfect outside the garage too. Great for the pantry, the laundry room and even the closet. Tough enough for commercial and industrial applications. Our kits include everything you need to build a stand alone shelf. We also have add-on kits. Casters, additional shelves and accessories can be added.